This week’s topic is “Ten Books That Will Make You Laugh (or at least chuckle)” and I’ve read some great books in the last few years that will make you laugh. If not out loud, you’ll at least be grinning 😀 Here are my top ten books to read that will make you laugh, in no particular order. Backward Compatible by Sarah Daltry and Pete Clark is one of the funniest books I’ve ever read. It had my laughing till tears were rolling down my face. The story is about two college kids, who meet at a midnight game release. They dressed as favorite characters and fighting for the last copy of the game. They then decide to play the game together to beat it and possibly win a prize the creators have come up with. What makes it so funny though is the dry humor and game references. I wasn’t sure if I should be proud I knew them or embarrassed of my gamer phase. Either way it’s a 5 read for me! To see my review of Backward Compatible, click here. The Codex: An Angel’s Guide to Seducing a Human by Joe Duck was one of my top picks for 2015. This debut novel surprised me. I was expecting an over the top fantasy novel. What I got was a borderline satire about a naive angel who falls in love with a crass human girl and his Codex, a book that is supposed to guide him through life but instead gets a kick out of making a fool of the angel. I’m not sure I’ve ever laughed so hard at a book! But it wasn’t just funny, that’s not what kept me reading. The author actually had a decent plot and storyline that had me invested from page one. To see my review of The Codex, click here. Spelled by Betsy Schow is a very loose retelling of The Wizard of Oz. The author has created a land full of all fairy tales but combined it with today’s modern culture. For instance a T-Phone, instead of an iPhone. Fashion magazines full of the latest styles for your Princess. Those types of things. While the main character grated my nerves, she grew on me. While I’m not sure this is supposed to be a funny book, I found it ironically funny and would love to read more from this world. To see my review of Spelled, click here. Fast Forward by Juliet Madison reminds me of the Jennifer Garner movie 13 Going on 30. The main character in this book flash forwards to find herself married to the nerd in high school, she has kids, and her life is nothing of what she expected it to be. It’s funny at the same time that it can be heart-breaking. I fell in love with the characters and the sweet husband she doesn’t realize she wants. For those who love rom-coms, this is a must read! To see my review of Fast Forward, click here. Is Everyone Hanging Out Without Me? (And Other Concerns) by Mindy Kaling is like talking to your best friend. Written narratively, Mindy Kaling discusses what it was like growing up, pursuing her dreams and her fledgling career before she hit it big in The Office. I laughed, I cried, I got angry with her and then I was like I think I’ve found my new best friend (stalkerish I know but read it and you’ll agree). To see my review of Mindy Kaling, click here. Under a Georgia Moon by Cindy Roland Anderson is an extremely sweet romance that had me giggling and smiling throughout the book. You know those cheesy, Hallmark movies that they play nonstop during the Christmas season? Yeah, reading this book is like watching one of those. It’s funny, sweet, heart-breaking and just a really good read. To see my review of Under a Georgia Moon, click here. If We Were a Movie by Kelly Oram is the first rom-com I’ve read told entirely from the guy’s perspective and it was GREAT! Kelly Oram is one of those authors that when I read her books (especially the contemporary romance) I can’t help but smile. This one is no exception! I had this giant goofy grin on my face throughout the entire book. Who doesn’t like to smile when they’re reading?! To see my review of If We Were a Movie, click here. The Others series by Anne Bishop is not supposed to be funny…at least I don’t think it is. It’s an urban fantasy with some great paranormal elements and horrific scenes. However I can’t help but snicker every time I’m reading one of these books. The author tells the story from many different points of view, including some of the Others, like Simon the Wolf and Vlad the Vampire. With Simon (and all the characters) they don’t think like a normal human would think. They take a bit of the animal with them. Like Simon being a wolf thinks nothing about licking Meg (who is a human) on the cheek when he is in human form and he is confused at her discomfort. Again I can’t help but snicker at them! To see my reviews for The Others series, click here. 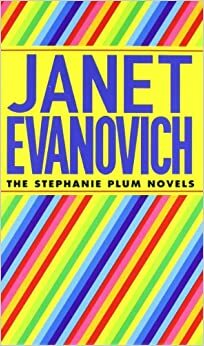 Stephanie Plum series by Janet Evanovich is one of my all-time favorite series, even after 22 books (number 23 comes out this fall). It’s humorous to see a woman down on her luck, trying and failing to be a bounty hunter. It’s the only job she can get! Add in her best friend, who is an ex-prostitute, and her gun-toting grandma and you have yourself one hilarious book. Not to mention the steamy on-again, off-again romance with beat-cop Morelli and her trysts with Ranger. One day though she’s gotta chose one or the other. To see my reviews for Stephanie Plum, click here. Lizzy and Diesel series by Janet Evanovich is an off-shoot of the Stephanie Plum series. Diesel shows up in the Between the Plum novellas and now has his own series with Lizzy. Lizzy is a baker, a normal girl. Or at least she thought she was until Diesel shows up needing her help to find the Stones which represent the 7 deadly sins. Each book in the series centers around one stone, the problem is that whoever is in possession of the Stones emulates the sin. It can make for a funny book! To see my reviews of Lizzy and Diesel, click here. I love The Others series and while I agree, they aren’t funny books, Simon and Sam and some of their interactions with Meg can make on chuckle to say the least. I am so bummed that the last book in the series is coming out next year. I know some series drag on and on but this is one I would like to see go a little bit farther. Great list! I didn’t realize the next book was the last one. That makes me sad. Love this series! Backward Compatible sounds amazing! Off to check out your review now..
Imogen recently posted…My ‘Eventually’ TBR! OOoh nice! I like The Others series! I remember a few laughs as well! Particularly those somewhat awkward moments with Meg and Simon! I adore Kelly Oram too (will get to meet her in June! ), so I love seeing her on your list as well!! And you sold me on The Codex…bought that baby and hopefully will actually get around to reading it in the near future!! I’m a little jealous! I was hoping to go to UtopYA this year but it’s the weekend we’re moving. Maybe next year!